For more information, contact the author – Carol Schwarz, MS, RD (carol.schwarz@unl.edu), Nebraska Extension Educator in Buffalo County. The term root vegetable is used for any underground part of a plant that we eat. The roots grow into the ground from the base of the plant. They come in a rainbow of colors and a number can be eaten raw or cooked. Examples of root vegetables include carrots, beets, onions, parsnips, potatoes, sweet potatoes and turnips. 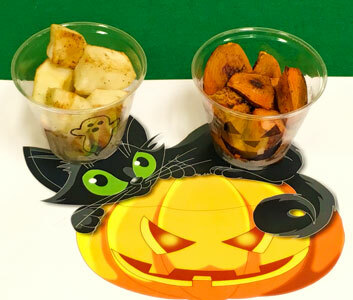 Explain to children they will be tasting different kinds of root vegetables. Show them a variety of root vegetables, (for example carrots, parsnips and beets). Ask if they have eaten any of these vegetables before. Put a slice of each root vegetable on each child’s plate. Taste one root vegetable at a time. Ask which one is the sweetest, smells the best, crunchiest, etc. Have them tell which root vegetable was their favorite. Preheat oven to 425oF. Line a baking sheet with foil. Scrub vegetables with a clean vegetable brush under running water. Peel vegetables (optional) and cut into 1-inch chunks. Place vegetables in a self-sealing plastic bag, add the oil and seal. Shake until vegetables are coated evenly with oil. Spread vegetables out evenly onto the baking sheet in a single layer. Sprinkle with salt and pepper. Roast the vegetables in the oven for about 40 minutes, stirring halfway through cooking, until tender and golden brown. Serve hot or lukewarm. Makes 6 servings. Each serving contains 213 calories, 13 g fat, 22 g carbohydrate, 4 g fiber, 290 mg sodium and 2 g protein.